Here we have another great video of a happy patient doing a review of Cancun Cosmetic Dentistry from our dear patient Timothy. We are so glad he decided to come to us. We hope this video can help other people make the right choice to start their journey to improve their lives with a new smile. Hi everyone! I’m doctor Cesar, and the patient Timothy is from California. He was looking to change his life, to change everything, so tell me Timothy what you think about your new looking teeth. I came to Cancun Dental with very high expectations. I did a lot of research on Cancun Cosmetic Dentistry. I approximately did for about 2 years. I researched for two years and I saw how all the people in the videos they all had different changes in their smile, before and after, and I watched and studies, and studied. But finally I got the course. I wanted the same change myself too, so I came to Cancun and they met my expectations, went beyond my expectations. The staff is very professional, the office is very clean, the doctors very educated in terms of dental work and I feel very fortunate and very blessed. And doctor cesar, he did a great great job on my smile. I haven’t smile in 22 years or more, so he has given me a new look, and new appereance and new emotional feelings, so I’m grateful… thank you! More or less 7 days, the job took some vacation, tell us, Cancun, did you like it? Cancun is beautiful. It’s beautiful! Jet Ski! I went to the mayan ruins, the museum, I went to see the world. People were nice here, very friendly, very courteous, very mannerable, I can’t wait to come back to Cancun again. A very pretty experience. My opinion to anyone in my position, who’s watching like I did, be like me now, I watched many videos and now, I wanted be the people in the videos to tell someone to come to Cancun, so I’m really honored by that. Come to Cancun, they are a great, great dental office. You will be happy, I’m very happy. Thank you so much! 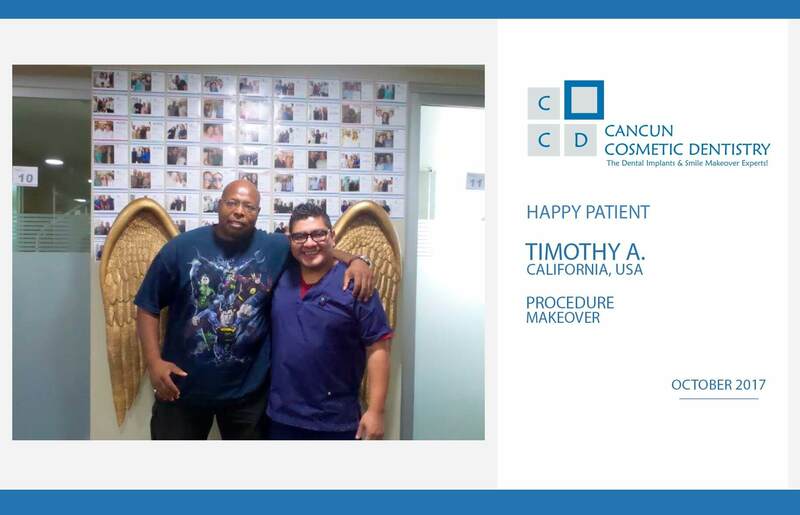 I’m doctor Cesar from Cancun Cosmetic Dentistry and Timothy from California. The best prices for dental implants are in Cancun Cosmetic Dentistry! What to do with a broken or a knocked out tooth? (TIPS) How can I find the most affordable cosmetic dentistry treatments?